Now, look. I just don’t do fancy recipes. Sure, the crepes looked impressive but really? I need recipes that are quick and easy and cheap. If they happen to look cool, well then goody on me. Some recipes are just kind of white trash and I don’t care. If I want to mix condensed mushroom soup and tuna and serve it over rice, then I will. I ate that a lot growing up and it still tastes pretty good. So hush. This recipe is just as simple and can either be used for lunch or dinner. They’re also pretty good left over and reheated the next day, so go ahead and make extra. I might make these soon and post some pictures, but don’t count on it. Preheat the oven according to the directions on the crescent roll package. In a small bowl, mix the tuna, egg, cheese, and celery. Unwrap the crescent rolls. In the center of each long triangle, place a spoonful of tuna mixture. Roll the crescent roll from the long edge to the point, and place on a cookie sheet. Bake per the instructions on the package of crescent rolls. My family ate these ALL THE TIME when I was growing up. I happen to have an unnatural hatred of raw celery, so Dad always made a few just for me without celery. If I accidentally grabbed one with celery I made the biggest absolute fuss over getting a crunchy bit in my mouth. It was very dramatic. That being said, I’ve always wanted to try this with some diced green apple in it. I’m a big fan of green apples and cheddar (a snack I constantly make for myself) and so I think it would be great. But C doesn’t WANT green apple in her tuna roll-ups so if I do it, I’ll have to make some separate for her. It’s the circle of life, I tell ya. Yet again, I was sitting around after midnight bored and with a sweet tooth. I felt like baking! But I didn’t feel like going to the store. I realized I had some green apples in the fridge and some chopped pecans in the cupboard. 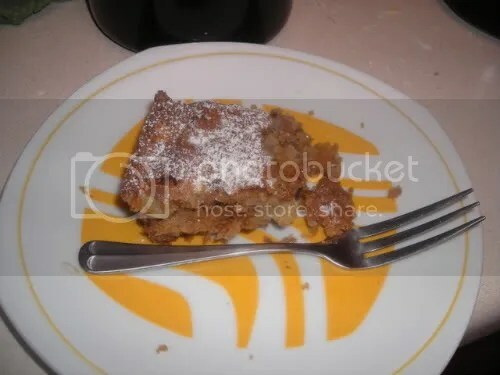 After an extensive search for some kind of apple cake that didn’t involve sour cream, applesauce, or any other ingredients I happen to be out of, I found a recipe here. And while that looks just dandy, it didn’t seem quite right. 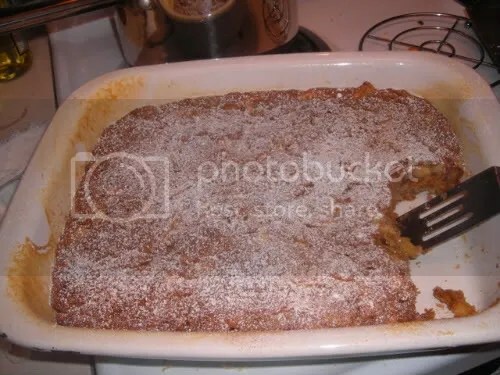 Apple cake with cinnamon but no brown sugar? Really? That makes no sense at all! So I played around with the recipe a bit, added WAY more cinnamon (of course), and came up with this slightly different version. They say on the site to use a wooden spoon to mix it but give no real reason other than tradition. Use a plastic spoon if you want, but I promise this batter will snap it right in two. And who doesn’t love a good wooden spoon anyway? I have several, and they are all a little different. But I love them equally. Well, maybe I love my roux spoon most of all, but don’t tell the other spoons that. This batter is insanely heavy and didn’t pour out of the mixing bowl so much as flop out in a giant lump. You’re going to think you made this wrong–I certainly thought so. It is dense and weird. There’s no way a mixer can work with this stuff. But it came out tasting good, so I don’t mind passing it on at all. Preheat oven to 350 degrees. Sift dry ingredients together into a mixing bowl. One at a time, add the oil, eggs, apple, vanilla, and nuts. Mix well with a spoon. 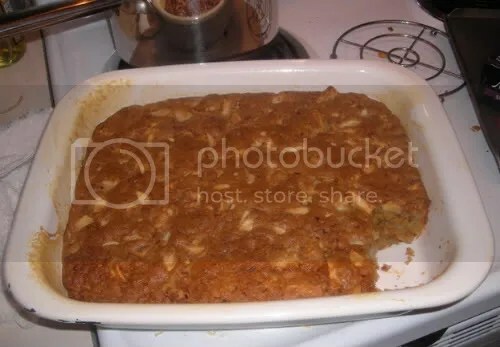 Grease and flour a 9×13-inch baking pan. Pour and spread batter into pan and bake for 55-60 minutes. Once baked, remove from oven and let cool. If you like, sift some powdered sugar and cinnamon over the top. This can also be served warm with vanilla ice cream or vanilla-enhanced whipped cream. Some notes: I might consider fine-tuning this a bit more, but I’m not sure what to do yet. It needs a deeper flavor–maybe more brown than white sugar? Or maybe some extra spice, like nutmeg? A little more salt to bring out the flavors and offset the sugar? Darker brown sugar? Orange zest? If anyone has any ideas, please pass them on. This cake has great potential! It did, however, come out with the most amazing crust on all sides, very crispy and sugary. I know! I was shocked as well. Not that she can’t cook, she just doesn’t much because 1) I’m home way more than she is and 2) I have control issues in the kitchen. Oh, and 3) I’m paranoid about what she’s doing to my kitchenware. Is my wok in the dishwasher? Good knife in a drawer? I plucked my favorite wooden roux spoon out of a sink filled with water last night and gave her the look. It’s a look that says “Please for the love of god no matter how many times I seem to tell you stop allowing my wooden things (spoons and cutting boards) to sit in water.” This post is quickly getting off topic. The point is–she cooked dinner for me last night. And it was great. Preheat oven to 450 degrees. Arrange two sheets of aluminum foil, one over the other. Drizzle approximately 1 tablespoon of olive oil in the middle. Arrange salmon fillets over the oil. Cover each fillet with 1-2 tablespoons of pesto. 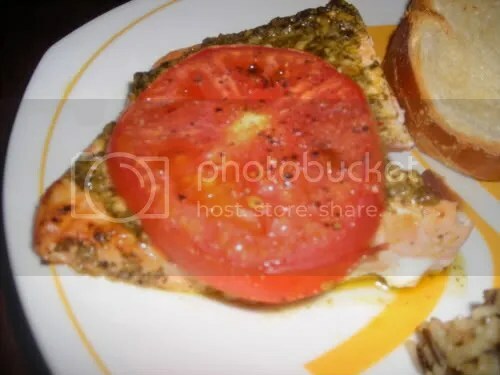 If you want, cut some Roma tomatoes in half lengthwise and place on the salmon cut-side up. Drizzle the tomatoes with a little more olive oil and sprinkle with salt and pepper. Bring the foil over the sides of the fish and seal the edges tightly, making an envelope. Bake at 450 degrees for approximately 15 minutes. If you want the tomatoes to get a little more roasted, open the envelope after 15 minutes and put under the broiler for a few minutes. If your envelope is small enough, or if you only want to cook one piece of salmon, this can be done in the toaster oven with great results. This was so good. Courtney made some wild rice to go with it. A vegetable would have been nice, but I honestly didn’t care. It was great and we watched Army of Darkness while we ate dinner. Which makes it a perfect evening, no? And all kinds of good fruit will soon be available. Naturally available and at farmers’ markets. Especially my favorite, watermelon. And while I love eating watermelon, sometimes I just wanna drink it. So, I do! By making this tasty concoction. Working in 2 batches, blend watermelon and lemon juice in a food processor or blender until smooth. Transfer to a pitcher. Bring water and sugar to a boil in a medium saucepan over high heat, stirring until the sugar dissolves. Add the hot syrup to the pitcher with the watermelon-lemon mixture and stir. Refrigerate until cold, about 2 hours. Serve over ice, garnished with lemon wedges. 1) Normally, making simple syrup calls for equal parts water and sugar. But the watermelon is already sweet, hence the lower amount of sugar. 2) Cutting watermelon is messy work! If you have an outdoor table, I recommend using it. 3) There might be some shockingly pink foam at the top of the pitcher. Don’t sweat it, it won’t kill you. 4) The watermelon in the drink is the heaviest bit, and tends to sink to the bottom of the pitcher. Give a quick stir before pouring to mix it all up again. 5) This is GREAT with a shot of vodka. I’m just sayin’. Courtney actually introduced this recipe to me (I know, right?) years ago. I had never had it before and I haven’t heard of anyone else making it since. Her grandmother used to make it for Courtney when she was a kid and it’s always been a favorite of hers. Eggs in white sauce. You make a white sauce, chop boiled eggs into it, and serve it on toast. It is wicked. Sinfully good and just vaguely unhealthy (which is why you serve it with bacon and only eat it once every few months). It completely DOES NOT WORK with margarine. You’ve been warned. And topping off the milk with a wee bit of half and half makes for a richer, smoother sauce. We made it just this morning and, among the moans of “oh my god why haven’t we had this in forever it is sooo good” I managed to get a quick picture of the final product. Some quick notes: The amounts listed below are for a medium-thick white sauce and it can easily be halved, doubled, quintupled, whatever. It’s the ratio that counts. And MAKE SURE to do everything on low until it’s time to stop. Otherwise your roux (which is what you have after all, flour and butter) might turn a color and before you know it you’re making gravy. For the two of us, we upped the recipe by 1/2 (which means 6 eggs, 3 tbsp of butter and flour, and 1 1/2 cups milk) but you just do whatever you want. I promise that this will feel like a decadent breakfast without a whole lot of work. In a sauce pan, melt the butter over low heat. Sprinkle in the flour and stir until just cooked. Pour in the milk and stir constantly, raising the heat in increments every 2 minutes until the mixture has come to a simmer and is thickened. Add salt and pepper to taste. Chop the boiled eggs into the sauce and mix gently. Serve warm over toast and with a side of bacon or sausage. When it’s this dish. Yes it is called Cherries Supreme Salad, but it’s a dessert. A pink, fluffy thing of madness that my mother made every holiday. I still love it. I neglected to make it this past Thanksgiving and my day was definitely off-kilter. It’s not as dessert-y as cake or some other things, but it is sweet and almost everyone loves it. My favorite part was when the pineapple got drained because it was always drained into a glass so I could drink it. Why not just buy the child some pineapple juice you say? Well . . . I don’t know. Maybe it was a weird luxury. Maybe that was the year we frequently ate tuna and mushroom soup over rice (a notoriously inexpensive meal). Maybe my parents knew that I would never finish the juice if they actually went out and bought it. The point is, I still drain the juice into a glass and drink it with gusto and a vague feeling of getting away with something. Combine all ingredients and refrigerate for at least 2 hours before serving. Some notes on this: I am not kidding when I say that the pineapple must be well drained. You don’t want a soggy dessert/salad. The longer it sits, the better it tastes. Oh, and trust me when I tell you that you are going to want a good rubber spatula for getting the condensed milk out of the can. And the cherry filling. If you want to be bad like I am, get some condensed milk on your finger. Then get some of the cherry goo on top of that. Insert finger into mouth and make yummy noises. Make rude gestures and get defensive when someone walks through the kitchen and gives you a funny look. 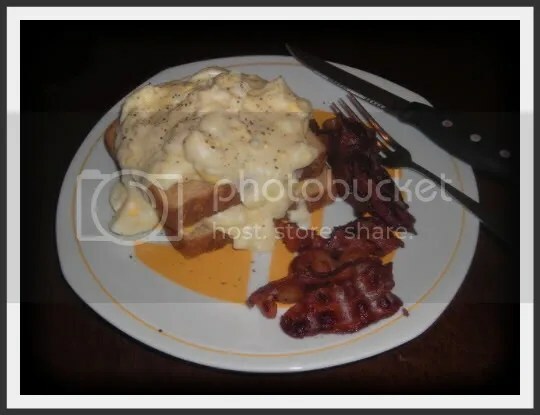 You are currently browsing the Fixin' to Eat blog archives for April, 2008.